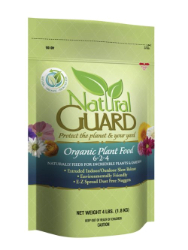 A natural choice for plants, flowers and vegetables. Slow release environmentally friendly e-z spread dust free nuggets. May be used on indoor or outdoor plants. Feed Organic Plant Food to outdoor plants and gardens during warm months during time of microbe activity. In the beginning, feed as needed up to once per month until that time soil nutrients are built up, then amounts may be reduced. Natural alternative to synthetic and non-cooked organic fertilizers. Controlled drying process, increases shelf life. Reduced odor levels from reduction in bacteria and moisture. High quality formulation utilizing feed grade organic ingredients. No sewage sludge, no manure, and no litter. Flower garden beds – 1 lb per 100sq.ft. Water in. Repeat montly. Indoor plants – 1 tbsp. For each 6 inches of pot diameter. Water in. Repeat monthly. Mulch / Planting soil – Mix 5 lbs. Per wheelbarrow load of compost.